Our Eye Massager is brilliant for effective relief from stress, headaches and migraines. - The Eye massager is literally a welcome sight. - It uses vibrating foam pads around your eyes to gently massage and relax them. With the valuable assistance of skilled team of professionals, we are engaged in offering an extensive range of high quality Eye Massager. 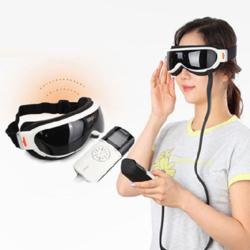 We have carved a niche amongst the most trusted names in this business, engaged in offering a comprehensive range of Eye Massager.